January disappeared! I'm looking forward to sunny days. My daffodils are about an inch out of the ground and all the roses have little buds sprouting on the branches. I love my apothecary jars and I found the glittered pine cones at Safeway on sale after Christmas. I knew I would get some mileage out of the darling glittery pine cones this winter and during next Fall and Christmas season. 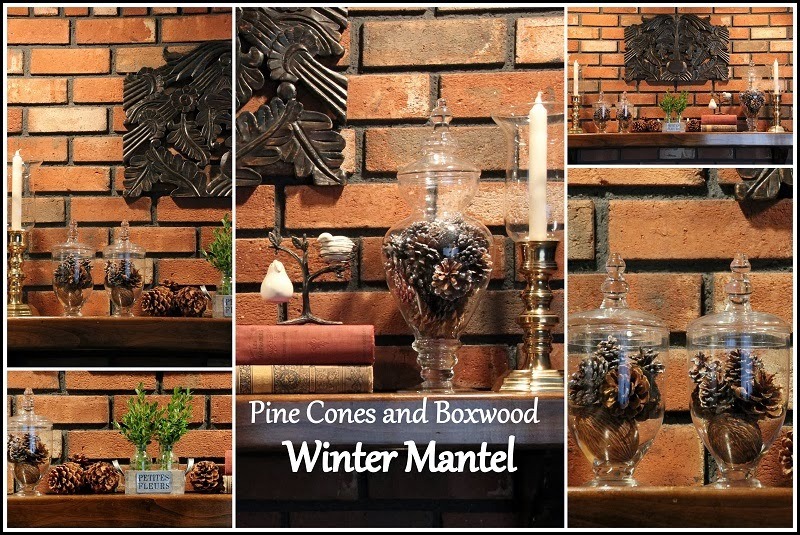 Always so much inspiration on blogs and pinterest on how to decorate a mantel. In 2014 my goal is to be more thrifty and shop my home. I'm running out of storage room and as I age I have less energy to move things around frequently. I would love to have this look for a few months at least. My project the next few weeks is to finish cleaning my craft room and work in my garden and getting it ready for our tour in May. As bloggers know time flies when having fun and my life just is going by way to fast. Very pretty, I love the pine cones in the jars. Beautiful mantel! Have a happy day! I use PhotoScape for editing. The effect I used for the picture is water painting in the filter dropdown. There is a new app for Apple products. It is water something or other. Kim at Savvy Southern Style did a post about it the other day. If you have an Apple product you can get that one. IPhone or Mac accepts that app.